Hand turned in maple by Jonathan right here in our Acton workshop. 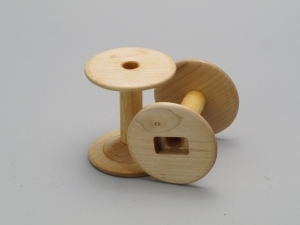 Bobbin capacity — about the same size as Ashford bobbins — is 3-4 oz of yarn, depending on thickness. You can add Scotch Tension to your Journey Wheel at any time (your Journey Wheel has pre-drilled holes for this). Instructions are included with your kit.